Fee Structure of the class can be obtained from School office or can be download from download center. Fee shall be deposited from 1st to 15th of every month between 8:00 a.m. to 1:30 p.m. on all working days. Failure to which a fine of Rs. 20/- will be imposed per month, for three months only. After three months the name of the student will be struck off the roll. 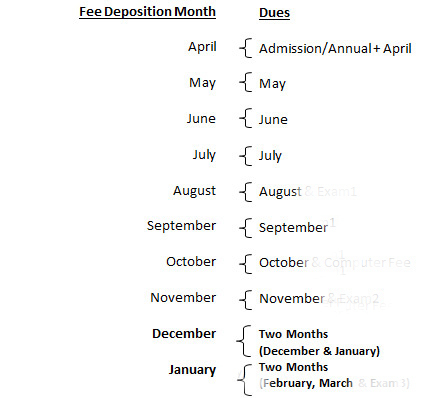 Last Date for depositing the Board Registration fee for class IX/XI is 10th of August. If any candidate who will deposit the said fee after this date, Rs. 100/- extra will be charged as a late fine up to 20th of August. After 20th of August no said fee will be deposit and the admission will be terminate. Last date for depositing the Board Examination fee for class X/XII is 15th of August. If any candidate who will deposit the said fee after this date, Rs. 200/- extra will be charged as a late fine up to 25th of August. After 25th of August no said fee will be deposited and the admission will be terminate. 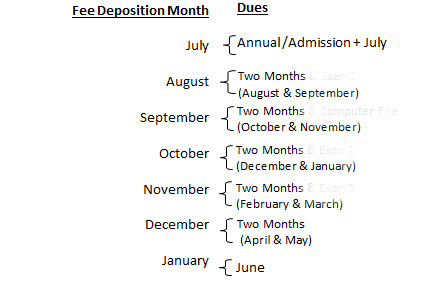 For class XI & XII, two months fee should be deposited per month from July to January.